Tributes have been paid to the first person to be elected to the Scottish parliament. Former Labour MSP Tom McCabe has died at the age of 60, the party has said. He was the first person elected to the Scottish Parliament, with his Hamilton South constituency declaring the result just over an hour after polls closed in 1999. Mr McCabe went on to serve as finance minister and held a number of other senior positions in parliament, but lost his seat as the SNP swept to power in 2011. Tributes have been paid to the politician who died at home after a short illness. Scottish Labour leader Jim Murphy said: "The thoughts and prayers of everybody in the Scottish Labour movement are with Tom McCabe's family today. That he has died at such a relatively young age and with so much still to give makes it harder to understand and accept. "Tom McCabe was a good man. He was a dedicated servant of the Labour movement, and was a radical Finance Minister in the last Scottish Labour Government. "I always enjoyed Tom's company - except on the golf course, where I could never beat him. "The dignity he showed in his final few months should act as an inspiration to us all. He will be hugely missed." Former first minister Jack McConnell said: "Tom McCabe was a major influence on local and national politics in modern Scotland. His roots and his family were at the core of his life and my deep condolences go to Shuming and all members of Tom's family today. "From modernising local services as a council leader to steering the new Parliament through difficult early years, his judgment and commitment were obvious to all who knew him. From the smoking ban to parliamentary standards, Tom's legacy is considerable. He will be missed by family, friends and by Scotland." First Minister Nicola Sturgeon wrote on Twitter: "Very sad to hear of the death of former Labour MSP, Tom McCabe. He was a genuinely good guy. My thoughts are with his wife and family." The Scottish Parliament's Presiding Officer Tricia Marwick said: "I am so sad to hear the news of Tom's passing. "He was devoted to his family, in particular to his wee daughter Ava. His joy when she was born and his delight in watching her grow was apparent to all around him. "We worked closely together on the Parliamentary bureau in the early days of the Parliament and then again when we were both elected to the Corporate Body. "Tom made an immense contribution to the Parliament and his expertise has been sorely missed since 2011. "My thoughts and prayers are with his family." Eddie McAvoy, who succeeded Mr McCabe as leader of South Lanarkshire Council, said: "I had worked with Tom since the 1970s, first at Hoover and then at the council. "He always wanted to do the best he could for the people he represented and he was a dedicated and committed public servant all his life. Tom was also a truly decent man and a great friend. 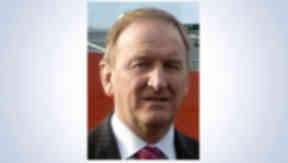 "His passing is a sad loss for South Lanarkshire, for Scotland, and most of all for his family. My thoughts are with them.‎"